This article is about the area of London. For the car company, see Vauxhall Motors. For other uses, see Vauxhall (disambiguation). Vauxhall (/ˈvɒks(h)ɔːl/ ( listen) VOKS-(h)awl) is a mixed commercial and residential district of southwest London in the London Borough of Lambeth. Vauxhall formed part of Surrey until 1889 when the County of London was created. Vauxhall has given its name to the Vauxhall parliamentary constituency, which extends to include all of Stockwell and parts of Brixton and Clapham all to the south, and to the Vauxhall Motors car manufacturer, which originated in the area, and possibly to the Russian word for a large railway station. From the Victorian period until the mid 20th century, Vauxhall was a mixed industrial and residential area. This consisted of predominantly manual workers' homes (many later demolished and replaced by Lambeth Council social housing after the Second World War) and business premises, including large railway works, gasworks and water supply works. The industry of the area contrasted with the mostly residential areas of neighbouring districts, particularly Kennington and Pimlico. In recent decades and similar to neighbouring areas in Battersea and Nine Elms, riverside redevelopment has converted most former industrial sites into residential properties and new office space. Vauxhall is 2.1 km south of Charing Cross and 1.5 km southwest of the actual centre of London at Frazier st near Lambeth North tube station. Vauxhall is adjacent to the River Thames, on the opposite side of the river to Pimlico. To the north is the district of Lambeth and to the northeast is the district of Kennington. South Lambeth, Stockwell and the Patmore Estate are to the south of Vauxhall. Many of the roads of Vauxhall converge at an area known as Vauxhall Cross, where both Vauxhall station on the South Western Main Line and the bus station are located. To the northeast of Vauxhall Cross is the Vauxhall Pleasure Gardens and to the southeast is the large Vauxhall Park. 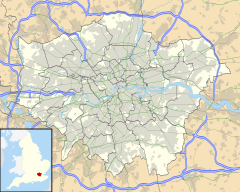 Vauxhall is located within the London Borough of Lambeth. Vauxhall is within and also has given its name to the Vauxhall parliamentary constituency. The sub-district of Oval is located within the eastern part of Vauxhall Parliamentary constituency, but the Lambeth Council electoral ward for Vauxhall is named the Oval. A map showing the Vauxhall ward of Lambeth Metropolitan Borough as it appeared in 1916. For a list of street name toponymies in the district see Street names of Vauxhall. It is generally accepted that the toponymy of Vauxhall originates in the late 13th century, from the name of Falkes de Breauté, the head of King John's mercenaries, who owned a large house in the area, which was referred to as Faulke's Hall, later Foxhall, and eventually Vauxhall. Samuel Pepys mentions Fox Hall (sic) in his diary on 23 June 1665:"....I took boat and to Fox Hall, where we spent two or three hours talking of several matters very soberly and contentfully to me, which, with the ayre and pleasure of the garden, was a great refreshment to me, and, ‘methinks, that which we ought to joy ourselves in." The area only became generally known by the name Vauxhall when the Vauxhall Pleasure Gardens opened as a public attraction and movement across the Thames was facilitated by the opening of Westminster Bridge in the 1740s. There are competing theories as to why the Russian word for a central railway station is вокзал (vokzal), which coincides with the canonical 19th-century transliteration of "Vauxhall". It has long been suggested that a Russian delegation visited the area to inspect the construction of the London & South Western Railway (L&SWR) in 1840, and mistook the name of the station for the generic name of the building type. This was further embellished into a story that Tsar Nicholas I of Russia, visiting London in 1844, was taken to see the trains at Vauxhall and made the same mistake. Alternatively, the locality of the L&SWR's original railway terminus, Nine Elms Station, was shown boldly and simply as "Vauxhall" in the 1841 Bradshaw timetable. Both these explanations can probably be dismissed, since the first public railway in Russia had already been built by 1837. This line ran from Saint Petersburg via Tsarskoye Selo to Pavlovsk Palace where extensive pleasure gardens had earlier been established. In 1838 a music and entertainment pavilion was constructed at the railway terminus. This pavilion was called the Vokzal in homage to the Vauxhall Pleasure Gardens in London. The name soon came to be applied to the station itself, which was the gateway that most visitors used to enter the gardens. It later came to mean any substantial railway station building (a different Russian word, станция (stantsiya), is used for minor stations). The word "voksal" (воксал) had been known in the Russian language with the meaning of "amusement park" long before the 1840s and may be found, e.g. in the poetry of Aleksandr Pushkin: На гуляньях иль в воксалах / Легким зефиром летал (To Natalie (1813): "At fêtes or in voksals, /I've been flitting like a gentle Zephyrus" [here "Zephyrus" is an allegory of a gentle, warm and pleasant wind ]) According to Vasmer, the word is first attested in the Saint Petersburg Vedomosti for 1777 in the form фоксал, which may reflect an earlier English spelling, Faukeshall. Englishman Michael Maddox established a Vauxhall Gardens in the Saint Petersburg suburbs (Pavlovsk) in 1783, with pleasure gardens, a small theatre/concert hall and places for refreshment. Archdeacon William Coxe describes the place as a "sort of Vauxhall" in that year, in his Travels into Russia. There is no mention of Vauxhall in the 1086 Domesday Book. The area originally formed part of the extensive Manor of South Lambeth, which was held by the de Redvers family. Falkes de Breauté acquired it in 1216 when he married Margaret, widow of Baldwin de Redvers; de Breauté's lands reverted to the de Redvers family after his death in 1226. In 1293 South Lambeth Manor and the Manor of "la Sale Faukes" passed, probably by trickery, to Edward I. In 1317 King Edward II granted the manor of Vauxhall, Surrey, to Sir Roger d'Amory for his "good services" at the Battle of Bannockburn. From various accounts, three local roads – the South Lambeth Road, Clapham Road (previously Merton Road) and Wandsworth Road (previously Kingston Road) – were ancient and well-known routes to and from London. The land was flat and parts were marshy and poorly drained by ditches, and only started to be developed with the draining of Lambeth Marsh in the mid-18th century, but remained a village. Prior to this it provided market garden produce for the nearby City of London. Vauxhall Bridge and Vauxhall Bridge Road were opened in 1816. By 1860 the village had been subsumed by the town of Lambeth. Many of Vauxhall's streets were destroyed during the construction of the railway to London Waterloo via the Nine Elms to Waterloo Viaduct, by German bombing in World War II or ravaged through poor city planning. Many Vauxhall residents live in social housing. There are several gentrified areas, and areas of terraced townhouses on streets such as Fentiman Road and Heyford Avenue have higher property values in the private market; however, by far the most common type of housing stock in Vauxhall is flats, both conversions and purpose built blocks. Vauxhall is also a popular residential area for members of parliament and civil servants due to its proximity to the Houses of Parliament and Whitehall; Kennington is within the area wired for the Commons' Division bell. Some 18th and 19th century property also survives – most famously Bonnington Square, a community that emerged from the 1970s–1980s squat scene in London and remains as mostly housing co-operatives today. Vauxhall is a very ethnically diverse area, with approximately 40% of residents originating from a non-white ethnic group. There is a significant Portuguese community, some with a connection to Madeira; many Portuguese restaurants and bars are located in South Lambeth Road and the surrounding area. There is also a Muslim community, with almost 6% of residents declaring themselves as Muslim in the 2001 census. The explosion in London property prices during the late 1990s and early 2000s has led to a boom in riverside construction, such as the large St George Wharf development by Vauxhall Bridge. Much of the area in Vauxhall contains light industry, offices and government buildings. Many companies and organisations were attracted in the past by Vauxhall's central location and comparatively cheap rent compared to Westminster on the other side of the river. In recent years, Vauxhall's riverside has undergone major redevelopment with the construction of a number of modern residential and office blocks, most notably the distinctive SIS Building at Vauxhall Cross. There are also a number of new commercial businesses moving into the area including Bathstore, Topps Tiles, Apolaki Krav Maga & Dirty Boxing and Metropolis Motorcycles as well as proposals to redevelop the Sainsburys site. Vauxhall is home to a number of gay bars and nightclubs, such as Area, Chariots, The Eagle, Fire and the Royal Vauxhall Tavern, as well as other venues often holding special events for gay clubbers, such as Club Colosseum, Hidden and Renaissance Rooms. The aforementioned Royal Vauxhall Tavern dates back to at least the late 19th century, and was for many years a traditional English music hall and cabaret venue. In recent years the building has come under constant threat of buyout and demolition from property developers, as it stands alone on a prime piece of grassland adjacent to Vauxhall railway station. However, the pub was bought in 2004 by sympathetic owners who have announced, "business as usual". Vauxhall was originally the home of the more underground gay clubs with the arrival of Crash in the 1990s. Over the years, more clubs and gay businesses have followed Crash's lead by opening up in the railway arches underneath the main line out of Waterloo station. One of the most notable venues to open in the area is Fire Night Club which is located on Parry Street and currently occupies six of the arches aforementioned. Fire was the scene of a drugs raid by the Metropolitan Police Service on 28 April 2007 where nine people were arrested. The tactics used in the raid (namely photographing all the persons leaving the venue) were strongly criticised by the gay press at the time. The burgeoning club scene and the lure of the more trendy railway arches once made Vauxhall a prime destination for businesses to open up in, including London's only exclusively gay gym, Paris Gym, another branch of Chariots gay sauna and the Sunday Morning Afterhours venue, Beyond hosted at 'Area' club. The area at the time earned the nickname "Vauxhall Gay Village". During the mid-2010s many venues have closed due to gentrification, amongst them The Hoist and Barcode. Before Vauxhall earned its reputation as a gay village, it was regarded among the underground gay club scene as the place to go to avoid the more commercial nights elsewhere in central London. However, the market has become more and more lucrative with the arrival of more venues and more nights, and Vauxhall has been criticised as becoming increasingly commercial, diluting its once underground appeal. But the demise of other club venues in London, such as Turnmills, the Astoria and The Fridge, have led to the gay club scene to become more centralised in Vauxhall, turning it into an alternative destination from Soho for gay people to socialise. Vauxhall has also become colloquially known as "Voho" (a portmanteau of the names Vauxhall and Soho) within the gay community, due to the emergence of Vauxhall as a gay village after Soho. Entertainment in the Vauxhall area is not exclusively aimed at gay clientele; the oldest strip pub in London (the Queen Anne) sitting at Vauxhall Walk has now closed to be replaced with The Tea Theatre, a 1940s themed tea room. By Vauxhall Bridge stands the central headquarters of the British Secret Intelligence Service (more commonly referred to as MI6), which occupies offices built between 1989 and 1992 and commonly referred to as Vauxhall Cross. Since 1992 a large complex of apartments and offices has been built to the south of Vauxhall Bridge at St George Wharf. Part of this development includes the St George Wharf Tower, completed in 2014. Vauxhall is also home to Brunswick House, a listed Georgian mansion and former home to the Dukes of Brunswick. Built in 1758, it once stood in three acres of riverside parkland – now it sits overshadowed by the St George Wharf complex. The building was in a state of disrepair and was on the English Heritage 'Buildings at Risk' list until LASSCO (the London Architectural Salvage and Supply Company) acquired it in 2004 and restored it as a premises from which to sell architectural salvage. It also has a restaurant and is an events venue. St Peter's Church in Kennington Lane was designed by the 19th century architect John Loughborough Pearson, who also designed Truro Cathedral and Brisbane Cathedral in Australia, as well as being responsible for restoration work at Rochester, Bristol, Peterborough, and Lincoln cathedrals. As of 2015[update] the church building serves as a community centre and arts venue as well as a church. Next to St Peter's is Vauxhall City Farm. Vauxhall is well connected even by central London standards. London Underground, National Rail trains, and London buses are all available at Vauxhall station. The tube stop is on the boundary of zones 1 and 2 of the London Travelcard area on the Victoria line, and Northern line stations are within walking distance of many parts of Vauxhall, though the nearest is Oval. The railway station is served by South Western Railway to and from London Waterloo, which is one stop away. Vauxhall bus station has 14 routes serving various parts of London. The availability of underground, trains, and buses has given Vauxhall a PTAL rating of 6b at its centre. In addition to public transport, Vauxhall is accessible by major roads and the Thames Path pedestrian and bicycle trail. Vauxhall also has two 17 space Santander Cycles docking stations and Cycle Superhighway 7 runs through the area. Vauxhall Cross is immediately to the southeast of Vauxhall Bridge where six major roads converge, including the Albert Embankment, which exits the Cross to the north and is the southernmost point of entry into the London congestion charge area. Vauxhall Cross was described as "one of the most unpleasant road junctions in South London" in Nikolaus Pevsner's architectural guide to London. Through 2002 to 2004 the Cross underwent a gradual redesign to accommodate a bus interchange linked to the Vauxhall mainline railway and tube stations, both of which are located to the southeastern end of the cross. Work has involved design changes to traffic lanes, improved pedestrian and cycle crossings, refurbishment of walkways beneath the mainline railway viaduct, and the construction of a bus station, completed in December 2004 featuring an undulating steel-frame canopy and ribbed steel walls. An interesting feature of the canopy is a series of photoelectric cells generating electricity to offset the energy used by the bus station. Vauxhall Park contains an area of miniature model houses (also in Fitzroy Gardens, Melbourne) as well as tennis courts, day care in the "one o'clock club", and children's playground. It is open daily for recreation and has an "open day" once a year. Vauxhall City Farm, located within Vauxhall Pleasure Gardens is open daily and contains a range of animals including alpacas, sheep, goats and pigs. Vauxhall is the home of Vauxhall Gardens Estate Residents and Tenants Association (VGERTA) that represents 2,500 residents in Vauxhall Gardens Estate which is the biggest Presidents and Tenants Association in Lambeth. VGERTA and their committee has received a number of awards for their contributions to the local community. VGERTA's biggest success to date is the fundraising of £165,000 for the full regeneration of the Glasshouse Walk Playground that was successfully completed in July 2013. ^ "Vauxhall". Collins Dictionary. n.d. Archived from the original on 2 April 2015. Retrieved 23 September 2014. ^ "Oval Electoral Ward" (PDF). Lambeth Council. Archived (PDF) from the original on 14 August 2016. Retrieved 11 April 2018. ^ "Overview of the Borough" (PDF). Lambeth Council. Archived (PDF) from the original on 4 March 2016. Retrieved 11 April 2018. ^ "Etymology of Vauxhall". Etymonline. Archived from the original on 12 April 2018. Retrieved 12 April 2018. ^ "Vauxhall (Foxhall)". Pepys Diary. Archived from the original on 12 April 2018. Retrieved 12 April 2018. ^ a b Hibbert, Christopher (2008). London Encyclopaedia. Macmillan London Ltd. p. 967. ISBN 978-1-4050-4924-5. ^ "1841 Railway guide for Vauxhall". Geog.port.ac.uk. 26 September 2001. Archived from the original on 5 March 2012. Retrieved 21 May 2012. ^ a b c "Sheppard FHW, 'Vauxhall and South Lambeth: Introduction and Vauxhall Manor', Survey of London: volume 26: Lambeth: Southern area (1956), pp. 57–59. (Date accessed: 22 December 2009.)". British-history.ac.uk. 22 June 2003. Archived from the original on 20 March 2012. Retrieved 21 May 2012. ^ Neighbourhood Statistics. "Retrieved 28 March 2011". Neighbourhood.statistics.gov.uk. Archived from the original on 5 September 2012. Retrieved 21 May 2012. ^ "Retrieved 28 March 2011". Statistics.gov.uk. 27 March 2011. Archived from the original on 10 January 2007. Retrieved 21 May 2012. ^ "Krav Maga London – Full Time Self Defence Training Academy". apolakikravmagalondon.com. Archived from the original on 5 September 2015. ^ "Retrieved 28 March 2011". Sainsburys-nineelms.co.uk. Archived from the original on 13 July 2012. Retrieved 21 May 2012. ^ "Vauxhall gay village". Timeout.com. Archived from the original on 16 May 2012. Retrieved 21 May 2012. ^ Writer, Staff (28 April 2007). "Concerns raised over police tactics during gay club raid". PinkNews.co.uk. Archived from the original on 21 August 2010. Retrieved 21 May 2012. ^ "Keep it glad, Keep it mad, Keep it gay!". Londongayman.co.uk. 30 April 1999. Retrieved 21 May 2012. ^ "Music at St Peter's Vauxhall". stpetersvauxhall.com. Archived from the original on 14 December 2013. Retrieved 14 December 2013. ^ "London Borough of Lambeth, 'Delivery of public transport infrastructure in Vauxhall', LDF Core Strategy topic paper 5, Lambeth: London, p. 2. (Date accessed: 28 December 2010.)". Google. Retrieved 21 May 2012. ^ "Friends of Vauxhall Park". Vauxhallpark.org.uk. Archived from the original on 13 April 2012. Retrieved 21 May 2012. ^ Mackill, David (1989). Rule of Law in England. Penguin. p. 34.